When it’s Thanksgiving, sweet potatoes are often on the menu, and when I visited Padma in Chennai, India where she was born, I experienced a delicious sweet potato dish made with a myriad of spices, cilantro and lima beans. It was delicious! 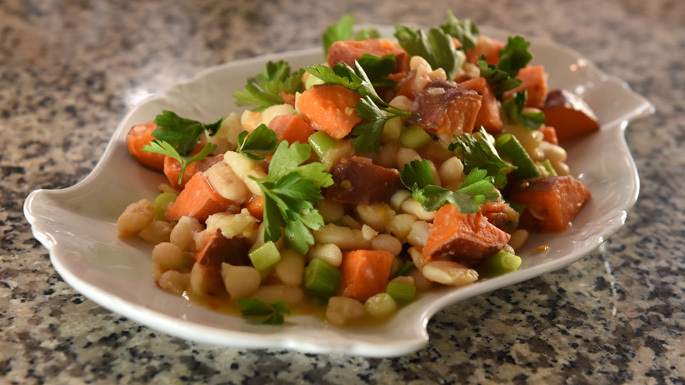 When I had her over to my house for the filming of the upcoming holiday special “Home for the Holidays”, I made it with parsley, fewer spices and cannellini beans. This is what I love about food. Try something, make it and then make it YOURS. Boil sweet potatoes, in enough water to just cover them, until tender, about 25 minutes. At the same time, in another saucepan, boil the lima beans in just enough water to cover them, about 15-20 minutes. Peel and dice the potatoes once they are cool enough to touch. Drain the lima beans. In a frying pan, heat the oil over medium heat. Add the mustard seeds; when they pop and start to crackle out of the pan, add the cumin, red chili, onion, garlic and ginger. Stir well and mix. Let the onion turn golden brown; then add the reserved lima beans and stir. Mix all the ingredients well, sauté for just a few minutes more to mingle tastes evenly. Salt to taste. Add lemon juice and stir. Garnish by sprinkling cilantro over the top.